WP Auction Software is a premium plugin from WPEka that has been designed to add auction sale functionality to WordPress. The plugin contains everything that is needed to enable you or your visitors to start listing items for sale on your website on an auction basis, including managing the bidding process, and collecting payments from the successful bidder. To find out if this plugin is the right choice for you and get a good understand of its features and how it works, read on for our WP Auction Software plugin for WordPress review. The core feature of the WP Auction Software plugin is that it allows you to list and sell items from your WordPress-powered website in the auction format, where visitors can bid against each other in order to try and secure the product or service being listed. As well as the traditional auction style of selling items, where interested parties can submit a bid until the closing date, with the highest bidder wining the item, there are other ways to list your items with WP Auction Software. As well as the standard auction type, the second option is to simply list an item at a fixed price where visitors can either take it or leave it, without having the ability to bid on the price. The third option is to run a penny auction, where bidders must pay a non-refundable fee to place a small incremental bid with the hope of winning the item for a greatly reduced price. In order for visitors to either start listing items for sale, or begin bidding and making purchases, they must first register an account and then login. This whole process is integrated into your site with the account data stored in WordPress without the need to rely on a third party service. After a visitor has registered they can then list their items for sale. When doing so, they can opt to pay an additional fee to list their auction as a featured item. These featured auctions are listed on the homepage and prominently displayed in order to catch the attention of visitors arriving at your website, with the aim of generating more interest in that particular auction. Another option for making their listings standout is the feature that lets those creating an auction decide to set it as a featured listing in the sidebar. This means their auction listing will be on display as the other visitors navigate their way around the site. WP Action Software supports payments through PayPal and Authorize.net giving you a choice of two popular payment gateways to choose from when setting up your WordPress auction site. 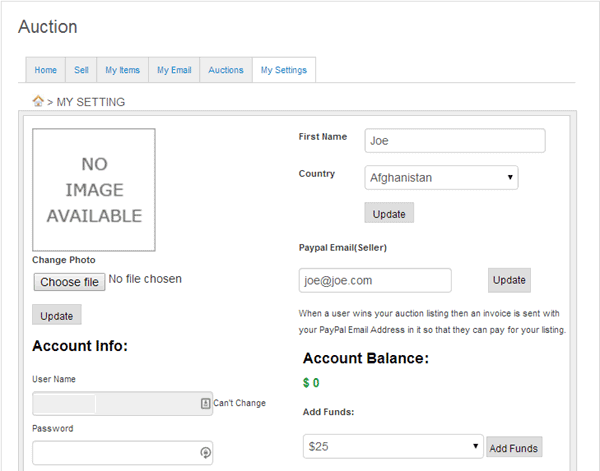 Sellers must enter their PayPal email address before listing an item so that the winning bidder can easily send a payment to secure the goods. Users can fund their account before commencing bidding, and this can be made a requirement of your users if you are operating penny auctions. One nice feature of this WordPress auction plugin is that your site will be able to auto-generate and mail out invoices to those who successfully win an auction. 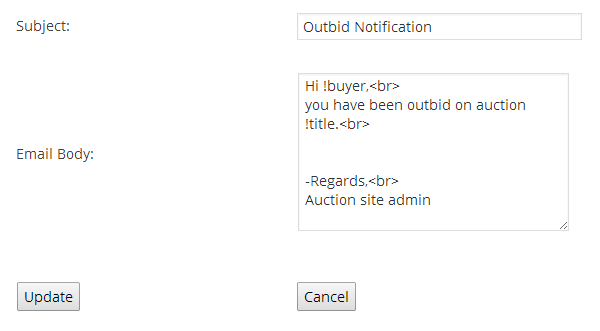 This is a hands-off process so you don’t have to worry about monitoring the auctions listed on your site and manually contacting the winning bidder. The plugin also contains other email templates which are delivered on certain actions, such as outbid, winner, loser, and item sold notifications. As a key part of buying online is the trust factor, being able to contact those selling items online, especially with the auction format, is an essential feature. Thankfully this plugin adds an internal messaging system to your WordPress site so that your sellers and buyers can contact each other. This allows them to ask pre-sale questions to help them decide whether they want to place a bid or not, and also finalise any other details after the auction has ended. 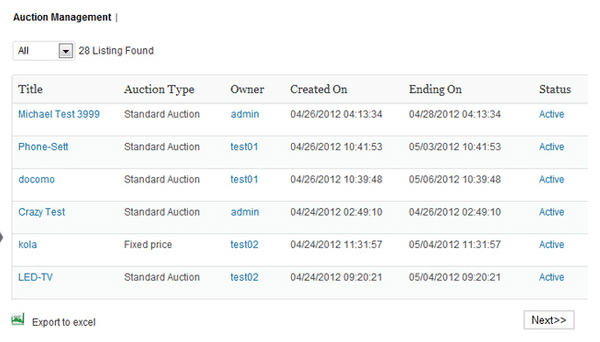 All the items listed for auction can be organized using the built-in features of WordPress, such as categories. Visitors to the site can browse the different auction categories and sub-categories to see what items are listed before deciding whether to make a bid or not. These auction categories are separate from the standard WordPress post categories, helping you to keep the two types of content separate. The plugin comes pre-populated with a large number of listing categories and sub-categories to save you time when setting up your site. Alternatively, visitors can also use the search tool to find all the items they are looking for. Once you’ve installed and activated the plugin, a new menu item is added to the WordPress dashboard where you can setup and configure how the plugin will function on your website. The package also includes a theme which can be used to style your auction site if you don’t have a preferred theme for building your website. There are also some other plugins which are required and recommended to be installed alongside WP Auction Software to create a fully functioning auction website. The user interface of the plugin has been created using the native WordPress UI so it’s very easy to navigate and make use of, with the options pages feeling like a standard part of WordPress. 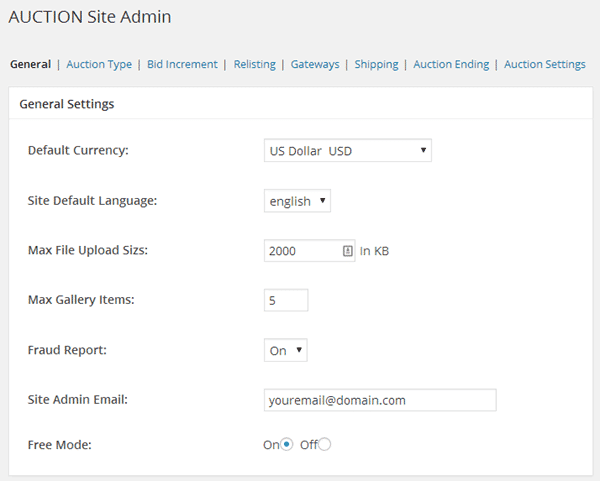 Once you have worked your way through all of the settings to configure your site, you can create the auction page by creating a new page in WordPress and adding a shortcode to insert the auction features. If you want to make the auction page the homepage of your website then it’s just a case of changing the default WordPress settings so that a static page is shown as the homepage. The plugin also comes with a number of widgets which can be added to your site’s sidebar or other widgetized areas. These widgets make it easier for your visitors to find the content on your site and the options include a quick search widget, a featured listings widget, and a sidebar login form. The final step in the setup is to create a cron job that runs every 15 minutes that will ensure all the auctions start and end correctly. The online documentation covers how to do this task for those that are unfamiliar with cron jobs. Once the site is up and running, visitors can create an account and setup their profiles. Then they can begin listing their items for sale, or biding on those items listed by others. 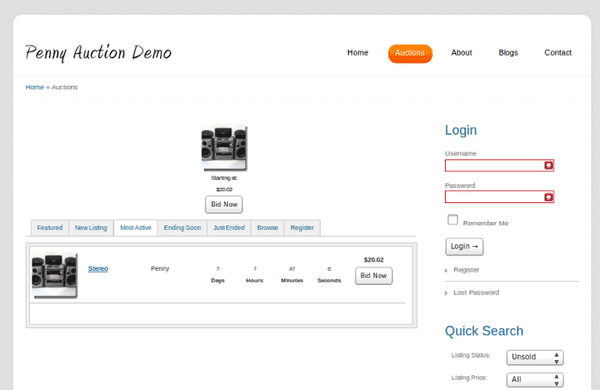 The plugin comes with a brief set of online documentation for setting up your auction website. The documentation doesn’t go into any detail about the features of the plugin, but does cover how to install the plugin and create the auction page on your website. Customers of WPEka also get access to a series of WordPress training videos which cover the core functionality of WordPress, making it a great option for those new to the platform. 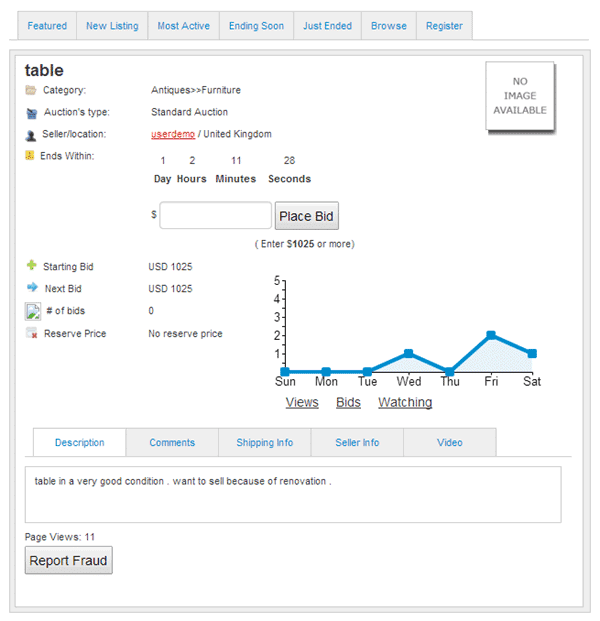 The WP Auction Software plugin is available from WPEka as part of their theme and plugin club. This means that when joining their club you not only get access to this plugin but 19 other plugins and 24 WordPress themes, with the promise of at least four new products being released every month. The WP Auction Software plugin from WPEka certainly has all the features you need to turn WordPress into an auction website, or just add this method of selling items online to your existing website. The back end admin user interface is clearly designed and well-presented making it fairly straightforward to walkthrough all the settings that are on offer and start listing auctions on your website. The front end registration and login forms make it easy for visitors to sign up and either start listing their own items for sale, or begin bidding on those items listed by others, while the email notifications are automatically sent out to keep both buyers and sellers in the loop.